The sculptures could be of anything related to Mardi Gras, and each team took a unique twist on the ubiquitous idea. Ideas ranged from a marching band and parade to the iconic Mardi Gras mask. A purple and gold Mardi Gras float decked out in refried beans and Campbells’ soup. A giant mask of green beans and black-eyed peas. 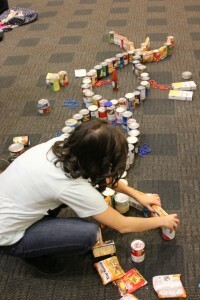 These festive arrangements of canned food are headed to Wright State’s Friendship Food Pantry. 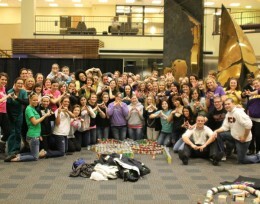 On March 8, at the second-annual Pan Hellenic canned food sculpture contest, students from Pan Hellenic Council sororities and fraternities gathered in the Student Union Atrium with donations of canned goods. Each group arranged their cans in a Mardi Gras-themed scene decorated with green, gold and purple. At the end of the night, four sororities (Delta Zeta, Kappa Delta, Theta Phi Alpha and Alpha Z Delta) and one fraternity (Sigma Phi) had collected over 850 cans to donate to the Friendship Food Pantry. Wright State student Rachel Schroerluke, who organized the event, said it’s becoming an annual event. Four sororities (Delta Zeta, Kappa Delta, Theta Phi Alpha and Alpha Z Delta) and one fraternity (Sigma Phi) had collected over 850 cans to donate to the Friendship Food Pantry. “The goal last year was the Wright State food pantry had just opened up, and we wanted to get them started with some donations,” she said. Next year, the event will take place during spring semester.